Look for RJ45 color code a , b and standard make a ethernet crossover cable or a straight throught cable , RJ45 or Registered Jack 45 , is the one of the most popular component in computer and communication network. Anyone working in networking field came across this connector every now and then. Because of this connector different devices talk with each other. RJ45 connector has a plastic body and inside it there are 8 conductor wires. This connector is used on both the ends of UTP cables. UTP cables having RJ45 at both end, is either a cross cable or straight through cable. There are 8 wires in every UTP cables, there is a pattern on how to place them in correct position in RJ45 connector to get desired functionality. This is achieved by following RJ45 color code scheme. Color coding is a pattern that tells you how to place 8 UTP wires in RJ45 connector to get a working cable. There are two popular color coding standards TIA/EIA 568A and 568B. 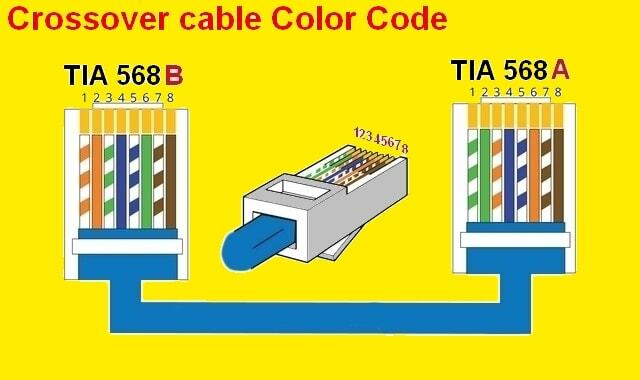 It's very important to get familiar with these two color code standards if you are working in networking field, as these color coding standards are used to make Straight Through and Crossover Cables. 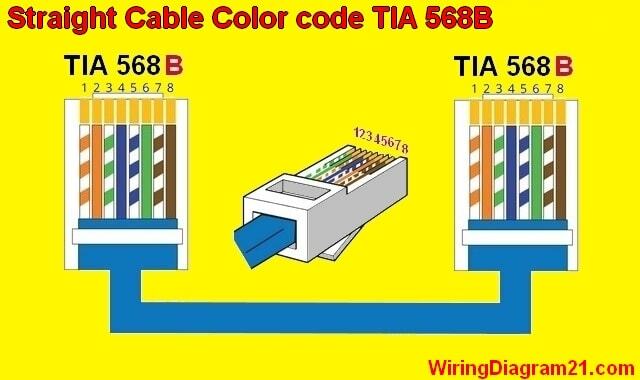 We start the article by having a look at what TIA/EIA 568A & 568B color coding standards are and then we will see how this is used in making Straight Through and Cross Over Cable. These standards are used on Ethernet wires and can also be classified as Ethernet Color Code. 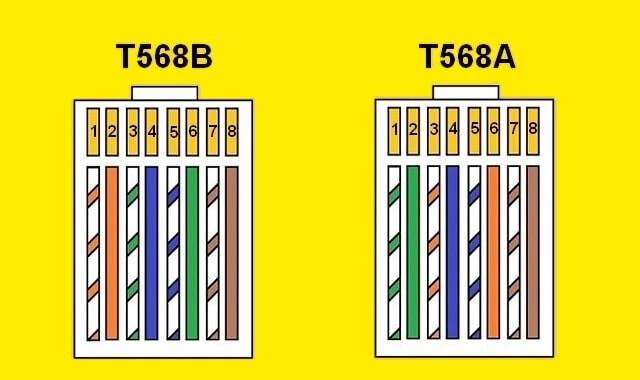 Following diagram illustrates T568A and T568B RJ45 color code standard. On left is 568B and on right is 568A color code standard. We look into each of this standard one by one. having getting familiarity with TIA/EIA 568Aand 568B its time to get how these two standards are used in straight through and crossover cable. If on one end we are using 568A, other end must uses 568B. Following is an example of cross over cable. We can see that left side connector is using 568B while other end is using 568A. To summarize, both end of UTP cable should have opposite color coding standard. There is a logic behind changing wire combination at 1,2,3 and 6 at both ends. We can see that wire 1 and 2 on left are terminating at 3 and 6 on the right, while 3 and 6 on left are going on 1 and 2 on right, rest combination at 4,5,7 and 8 are same at both ends. This is because crossover cable is used to connect different type of networking devices, so when device on left is sending at pin 1 and 2 its received at pin 3 and 6 on the right. Whereas pin 3 and 6 on left are receiving what devices on right is sending. Without this crossing of cable at both ends, communication between both different devices is not possible. Following is a diagram that shows a Straight Through Cable that is using 568A color coding. It's difference from crossover cable is that, both end are following same type of color coding standard. Here both end of UTP cable has 568A color code standard. Following is Straight Through Cable that is using 568B of Rj45 Color Coding standard. Both ends of this cable has 568B standard. To summarize, if one end of UTP cable is using 568A color code standard than other end must also use 568A, same holds true for 568B. Now that we have seen both 568A and 568B color code standard and how they used in making Straight Through or Crossover cable. We can see that both these standard have small difference only green and orange pairs are swapped while remaining combination remains unchanged. It's important that if you are working in the field of computer networking then you must have knowledge about color code standards and which combination is used while making Straight Through or CrossOver Cable. It's also important to mention about Automatic Medium-Dependent Interface Crossover (Auto-MDIX) standard. Almost all networking devices available today supports Automatic Medium-Dependent Interface Crossover (Auto-MDIX) standard. The auto-MDIX standard has been devised so that devices can adjust automatically there sending and receiving pins, now devices by themselves can decide that which type of cable is used and adjust their sending and receiving parameter. Which means you can use straight through to connect same devices as well as different devices and same hold true to cross over cable. So if you have only Straight Through Cable and you want to connect same type of devices like a switch to switch, you can connect them using Straight Through cable as both end of switches will adjust sending and receiving pins. In order to use UTP(Unshielded Twisted Pair) cables you have to terminate both ends of cable across an RJ45 (Registered Jack 45) connector. 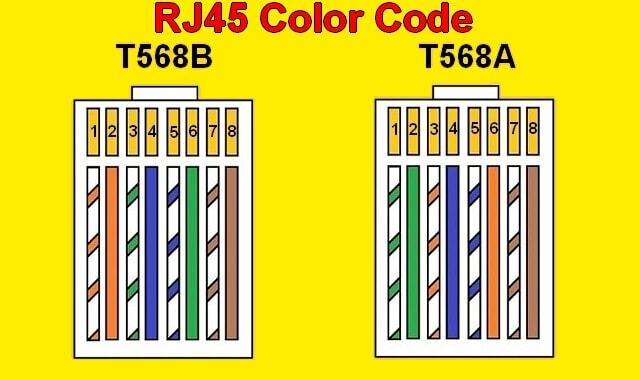 As there are 8 wires in every UTP cables, you have to follow color coding standard on where to place each wires at RJ 45 connector. If you are using UTP cat 5 cable than you have to follow cat5 color code in order to make a working cable. These both standards are used in making cross over or straight cable. 568A was first color code standard introduced in mid of 1980 and is rarely used now a days. The second one is 568B, it's the most popular one and still in use. 568B is widely used in making straight trough cables by cable manufacturer. In order to make crossover cable you have to keep one end of cable as 568A or 568B and second one the opposite to that. For instance, if you are using 568A on one end than second end must be 568B. For straight through cable both end of cables must follow same standard. for instance if you are using 568A on one end than other end must also use 568B. Following are steps on how to crimp a cat5 cable , or cat 5 color code. In order to get started, first thing you have to do is cut the outer jacket of UTP cable using either a stripper or crimping tool. You can cut as much you want but good practice is that jacket of cable should be inside the RJ45 connector. After removing the jacket you will get four pairs. You have to separate each wire for putting it into RJ45 connector. Depending upon the color coding you are using separate each pair, as shown in diagram below. After getting all eight pairs separated, align all eight wires as per your coding standard (as shown in step 3 diagram). One you have all your cables aligned, next thing you have to do is cut them from top. Make sure they all have same point of cutting as shown in figure so that they can fit well into the RJ45 connector. After cutting your cables place your cables in your RJ45 connector make sure all 8 wires are well inside the connector. .After you placed cable in the RJ45 connector , place the RJ45 connector in the crimping tool and press it. Purpose of this is to make connection of UTP cables with RJ45 conductors. Make sure they both meet each other.